There are many different types of SQL Server latches, but essentially they can be split into three general categories: I/O latches, buffer latches, and non-buffer latches. In order to properly understand buffer latches, it is important to properly understand the idea behind the memory buffer pool, which is designed around the goal of maximizing SQL Server performance. The buffer pool is a physical memory range where data that is read from disk is stored in data pages. Data in SQL Server tables is stored in pages and each page has a fixed size of 8192 bytes (8 KB). 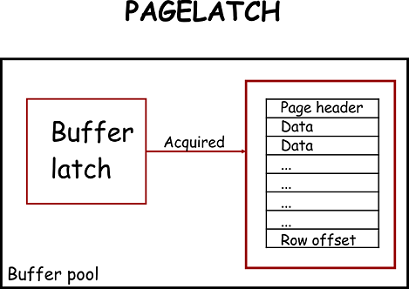 Whenever a data page has to be read or written to, it will be first brought into a buffer pool. In that way, any further access to that page will be read directly from the memory buffer pool, thus improving SQL Server performance by minimizing disk IO. This implementation of the memory pool concept in SQL Server is what drives SQL Server physical memory usage can be high even in situations where there is no SQL Server activity. The loading of data in the buffer pool is based on the First-In First-Out (FIFO) principle. Starting with SQL Server 2005, superlatches (also called sublatches) were introduced to improve SQL Server efficiency in highly concurrent OLTP workloads for a certain pattern of usage (i.e. very high shared read only access to the page (SH) while write access is very low or not exists). Superlatches are used by SQL Server only in NUMA systems with 32+ logical processors. This mechanism is an efficient way of SQL Server to deal with a latch contention by dynamically promoting an array of latches to a Superlatch and thus allowing an SH mode request to the superlatch, while the containing sublatches can remain different modes. When this occurs, the superlatch becomes just a pointer to an array of SQL Server latches. Situations when transactions/sec value is dropping when enabling additional logical processors while, at the same time, average SQL Server latch wait times are increasing at a greater rate than the system throughput, potentially indicate that there is a high probability that a problem with a latch contention may exist. The following image represents a typical situation where adding new logical processors worked until the certain point when longer latch wait times started to occur. This results in a situation where adding new logical processors will not have any benefits, up to a point where transactions/sec starts to negatively affect performance. This is ta typical situation where adding new logical processors actually had a negative, vs. a positive effect, as the resulting system environment will be spending a lot of time in a waiting state.